The sound of Burial Hex has been deemed "horror electronics" but on the basis of Book of Delusions it seems to me that definition of Clay Ruby's project falls far short. 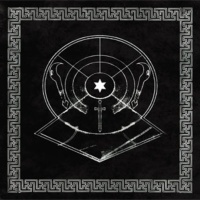 Sure Book of Delusions features black industrial atmospherics, but it also intelligently welds elements of power electronics, analogue electronics, chamber piano scores cut with black metal vocals into an impressive ritualistic horror film soundtrack styling. This Cold Spring CD edition features all the tracks from the vinyl issue of Book of Delusions, accompanied by the Burial Hex contributions to split vinyl releases with Kinit Her and Zola Jesus. Book of Delusions opens with 'Final Litany' featuring a recorded interview with Charles Manson, where his scrambled ramblings range from the soul roots of music to his childhood spent briefly in Father Flanagan's Boys Town, over swirling black electronics, ritual drums and cymbal crashes. Sinister whisperings waft over a baroque ascending scale. With lines such as "Christ have mercy on my soul", "Pray for us" it almost sounds lifted from a Catholic mass. It's deeply crepuscular and scary stuff only giving the slightest hint of what is to come, as it segues into the bowel scraping quakes and piercing frequency tones of 'Urlicht' ensnared in distortion and ritualistic thuds. The following track 'Crowned & Conquering Child' is perhaps the best representation of the work of Burial Hex. Utilising the writings of Aleister Crowley on the Law of Thelema and the New Aeon of Horus, the track is built on shrieking frequency tones, ritual pummel, whip crack and pulsating analogue sequences. The voice initially delivered in growled black metal tones switches to an anguished cry as it rips through passages of chamber piano accompanied by a massed choir from hell. It's maybe the intelligent use of choir that make this so harrowing but it does capture the essence of a cinematic horror score and is truly fantastic stuff. 'The Book of Delusions' is much more rhythmic stealing a rhythm from the dancefloor. Initially it made me think of the Wyrding Module, another group who incorporate dancefloor rhythms into their doom horror soundtrack styled music, but as the track progresses the doom laden vocal mannerisms carried more than a hint of Ian Curtis while the psychedelic guitar recalls contemporary PTV3/Psychic TV releases. Placed in the middle of the CD it sounds somewhat confusing but I guess it made more sense on the vinyl release where it appeared as a side long piece. The extra tracks, taken from split albums with Kinit Her and Zola Jesus, show further sides to Burial Hex. 'God of War and Battle' and 'Storm Clouds' are taken from Vedic Hymns, a split vinyl release with Kinit Her, originally issued on Altvinyl, which set the words of Gustav Holt to music. Both tracks feature chamber piano with Clay Ruby's throat-shredding black metal tones on the first, while he rasps his pained tones, in a similar manner to 'Crowned & Conquering Child', through the other, accompanied by a soft violin score. While these don't catch my interest so much, the two tracks from the split album with Zola Jesus on the Aurora Borealis do. 'Go Crystal Tears' returns to pulsing analogue electronics, stabbing ice cold piano notes with scouring black metal type vocals, ending on lashings of frequency noise. The album bows out on the impressive cinematic "horror electronics" of 'Temple of the Flood'. From dark industrial murk filled with sinister drones and corrosive textures, awash with eerie clanking and rattling sounds it finds itself with an incongruous combination of chamber organ and tribal rhythms that fall away to a bizarre mixture of chamber piano, running water and squelchy electronic tones before ending on organ chime.